Several Club Riders and a few Guests showed up at Glennwood Landing to prepare for the Ride to Leesburg. Some of the Members chose to head straight up, while 9 of us took a back road ride to the Mason Jar for lunch. Leaving the Restaurant we ran into a couple just fresh back from Leesburg. What they had to tell us wasn't pretty. The road in was lined with bikes and several places the line was at a dead stop. So we took a vote, do we head on into the stop and go traffic of Leesburg or go for a ride. It was Leesburg- 0, Ride- 9. So off we were. We rode to Gator Joes, then on to Duck's Dam Diner. Now I know we like to Ride to eat and Eat to ride, but we didn't stop at either one of them. 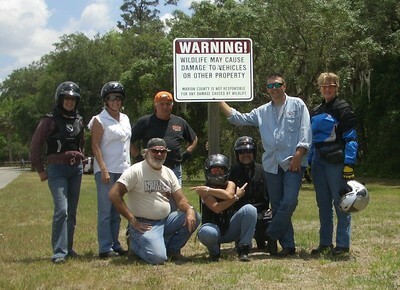 We did however stop at Moss Bluff at the Dam where we found a sign which read "Vehicles may be destroyed by Wildlife". Luckily we were living a Mild Life that day, so no Bikes were dammaged! After a cone and some more chatting we split up to make our way home. All in all it was a Great Day with Good Friends and lots of Fun.